The privately-funded investigation into the disappearance of Madeleine McCann is at risk of running out of money, her parents have said. Speaking three-and-a-half years after his daughter went missing on holiday in the Algarve, Gerry McCann said the cash "won't last anything like a year". 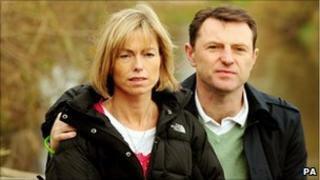 It comes as the McCanns launch a petition calling for a full review of the case by the UK and Portugal. The Home Office said it would ensure "everything feasible" was being done. Madeleine was three when she went missing from a resort in Praia da Luz on 3 May 2007. The Portuguese police investigation was supported by British officers but the inquiry was formally closed in July 2008. Gerry and Kate McCann, from Rothley, Leicestershire, set up the Find Madeleine campaign. The millions of pounds raised have been spent on private investigators who have interviewed hundreds of witnesses and logged more than 16,000 calls and e-mails. Mr McCann told the BBC: "We always have to keep an eye on the funds to make sure we are capable of supporting the investigation and it's so important that there's someone there at the end of a phone line, checking e-mails and speaking to people who come forward. "We're the only people who pay for that right now and it's through donations that we've a managed to do that." He said: "At the current rate it won't last anything like a year but we have to look at other fundraising aspects and it is very important to us that we are able to maintain a search". The Sun reports that the fund, which once peaked at £2m, is now down to £300,000, and the Daily Mirror estimates that it will run out by spring 2011. Even so, Mr McCann added that fundraising was a "secondary objective" and urged members of the public to sign the online petition to encourage the UK government to take action to identify areas for further investigation. In an open letter launching the petition, the couple ask why they still do not have access to all the information gathered by Portuguese police, and say it was "incredible" there has been no formal review of the inquiry. "We are certainly frustrated," Mr McCann said. "It's been such a long time and we have been asking over and over again for the authorities to do more. And they are not practically doing anything and haven't been for well over two years, and I don't think its right for us to be responsible for the continued investigation into our own daughter's disappearance." Mrs McCann said: "It's been over two years now since anybody other than ourselves have looked for Madeleine and obviously our own team has limitations because they can't go knocking on people's doors. They can't make people speak to them. "We also know there is information in several regions, lying on different desks, different databases that hasn't been put together. So two pieces might slot together and give you a result. We could be that much closer to finding Madeleine, but we need co-operation." The McCanns stressed they had not given up on Madeleine being found alive and cited the case of Jaycee Dugard being found in California, 18 years after she was kidnapped. "When a young child has been taken, there's more chance they have been taken to be kept and there's absolutely no evidence Madeleine has been seriously harmed and without that we've got to believe we can still find her," Mr McCann said. The couple's meeting with Home Secretary Theresa May in August came after earlier discussions with former home secretaries Alan Johnson and Jacqui Smith. "The government wants to ensure that everything feasible is being done to progress the search for Madeleine. The British authorities will maintain a dialogue with the Portuguese and continue to liaise with Madeleine's family on any developments."